1. The rise and fall of the Socratic problem Louis-Andre Dorion; 2. The students of Socrates Klaus Doering; 3. Xenophon and the enviable life of Socrates David K. O'Connor; 4. Socrates in Aristophanes' Clouds David Konstan; 5. Socrates and the new learning Paul Woodruff; 6. Socratic religion Mark L. McPherran; 7. Socrates and democratic Athens Josiah Ober; 8. Socratic method Hugh H. Benson; 9. Self-examination Christopher Rowe; 10. Socratic ignorance Richard Bett; 11. Reconsidering Socratic irony Melissa Lane; 12. Socratic ethics and the Socratic psychology of action: a philosophical framework Terry Penner; 13. Socrates and Eudaimonia Christopher Bobonich; 14. Socrates' political philosophy Charles L. Griswold; 15. Socrates in later Greek philosophy A. A. Long. 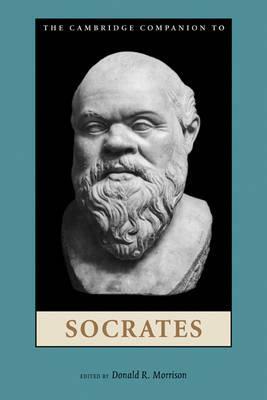 'This volume not only offers a coherent introduction to different aspects of Socrates for beginners in the field of study but also serves scholars who are experts in the field by discussing problems in major areas of Socratic research. Every essay is accessible, well informed, detailed, learned, and systematic in its presentation. The collection is a major achievement and will be an excellent tool for research. It will be read with profit by anyone who is interested in one of the most inspiring and influential figures of antiquity.' Michael Erler, University of Wurzburg 'This volume is as authoritative as it is diverse. Donald Morrison is to be congratulated for having assembled a stellar group of contributors from a variety of fields and of scholarly backgrounds, who between them do justice to the 'contested territory' that is Socrates - all within the convenient limits of a quite compact volume.' G. R. F. Ferrari, University of California, Berkeley 'Donald Morrison's volume brings together some of the best recent work on Socrates, representing a wide variety of approaches to this subject. It is a substantial contribution to Socratic studies and should prove to be an indispensable tool for further research.' Richard Kraut, Northwestern University 'This is a good book, and is more manageable in scope and half as expensive as the rival Blackwell Companion to Socrates. Donald Morrison deserves great credit for ably assembling an all-star team of contributors, and he includes a selective and well-organized bibliography and an index locorum.' Bryn Mawr Classical Review "This volume not only offers a coherent introduction to different aspects of Socrates for beginners in the field of study but also serves scholars who are experts in the field by discussing problems in major areas of Socratic research. Every essay is accessible, well informed, detailed, learned, and systematic in its presentation. The collection is a major achievement and will be an excellent tool for research. It will be read with profit by anyone who is interested in one of the most inspiring and influential figures of antiquity." --Michael Erler, University of Wurzburg "This volume is as authoritative as it is diverse. Donald Morrison is to be congratulated for having assembled a stellar group of contributors from a variety of fields and of scholarly backgrounds, who between them do justice to the `contested territory' that is Socrates - all within the convenient limits of a quite compact volume." --G. R. F. Ferrari, University of California, Berkeley "Donald Morrison's volume brings together some of the best recent work on Socrates, representing a wide variety of approaches to this subject. It is a substantial contribution to Socratic studies and should prove to be an indispensable tool for further research." provides a fine introduction to English language scholarship on Socrates.... uniformly high quality.... This is a good book, and is more manageable in scope and half as expensive as the rival Blackwell Companion to Socrates. 2 Donald Morrison deserves great credit for ably assembling an all-star team of contributors, and he includes a selective and well-organized bibliography and an index locorum. --David M. Johnson, Southern Illinois University, Carbondale , Bryn Mawr Classical Review "This book features 15 essays by famous scholars.... Recommended...."
--N. D. Smith, Lewis and Clark College, CHOICE "Unlike many of its counterparts (e.g., A Companion to Socrates, Blackwell, 2006), this companion (CCS) devotes more of its contents to Socrates' philosophy and less to his historical and political circumstance and his many influences upon subsequent cultures. In this sense, the CCS is more a companion to philosophy than is its counterparts.... the articles in CCS are uniformly of a very high level of scholarship, and each is authored by leading scholars in Socratic thought or in ancient philosophy more generally. CCS will be of particular use to scholars seeking to acquire a greater proficiency in Socrates, as the majority of problems central to that scholarship each receive sustained attention. Seasoned Socratics, too, will find some original and controversial work here and should therefore not overlook it.... Each piece includes its own bibliography. When taken together, these constitute as thorough a bibliography as one could hope to find on Socrates.... A clear strength of this volume is its collection of essays concerning the fabled "Socratic Problem."... I know of no other volume that has devoted such an array of worthy studies to this complicated issue..."
Donald R. Morrison is currently a Professor of Philosophy and Classical Studies at Rice University. He has also been a Rockefeller Fellow at the University Center for Human Values at Princeton University, a Junior Fellow of the Center for Hellenic Studies, and a Visiting Professor at the University Paris I-Sorbonne. His publications have appeared in edited collections and scholarly journals, including Polis, Ancient Philosophy and the History of Political Thought.